Slow Loris are interesting creature. I bet not all of you are aware of their existence… and there’s a reason why so… for they are dangerous as pets for they release toxins that can harm people… and they are also meant to stay in the wild. 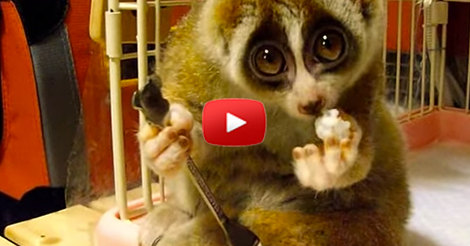 It is actually not allowed to own them, but as we all know, there are few people who still get their way to have them… but in the video below, we will see a different side of Slow Loris — a more delicate side. Meet Kinako, she has teeth and is domestically bred… and she is just adorable! Watch her cutely eating a small rice ball in the video below. I just hope it is safe for her to be in that kind of environment.